Due to rapid developments in the research areas of medical imaging, medical image processing and robotics, computer assistance is no longer restricted to diagnostics and surgical planning but has been expanded to surgical and radiological interventions. From a software engineering point of view, this enhancement causes new requirements, e.g. support of complex clinical workflows, integration of different kinds of hardware and data, real-time processing of data, and high robustness. To integrate image guided therapy (IGT) functionality to a general open source medical imaging library we presented an open source extension to the MITK for developing IGT systems. 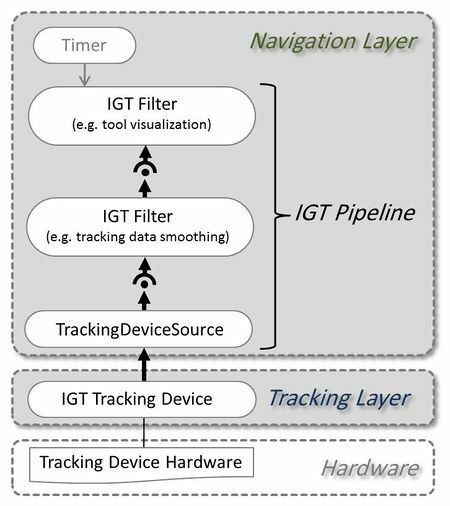 MITK-IGT consists of two layers for hardware control (Tracking Layer) and processing of tracking data (Navigation Layer) as depicted in Fig. 1. Additionally it offers components for rapid development of graphical user interfaces (GUIs) of navigation applications. Fig. 1 Layer structure of MITK-IGT. The tracking layer offers an interface for tracking devices and holds classes which establish connection to such devices. The following tracking devices are currently supported. The navigation layer holds classes relating to program logic of IGT systems. Thus, the hardware is clearly separated from the program logic and e.g. integrating a new device into an existing software is easy. The program logic is designed to be flexible by a pipeline concept (cf. Fig. 2). Different existing or even new designed filters can be applied to navigation data which is produced by a tracking device. You can combine these filter in many different ways and easily add new functionality, e.g. by simply implementing a new filter and integrating it into your pipeline. Fig. 2 Example pipeline of MITK-IGT. TrackingDeviceConfigurationWidget: Allows the user to configure a tracking device. ToolTrackingStatusWidget: Shows informations of navigation tools. LoggerWidget: Allows easy logging of navigation data streams. Offers XML or CSV format. PlayerWidget: Offers functionality to load logged navigation data streams and replay them. Plugin IGTExamples: Holds different views which are mainly thought as code samples and for learning purposes. Plugin IGTTracking: In this plugin basic tracking functionality is offered. You can track tools with your tracking system and log tracking data for example. You can use these Plugins by activating them in your MITK-build. We also offer an installer of the Plugin IGTTracking which can be used as a sample Application and also offers useful functionality to use different tracking systems. Please note that IGT is under heavy development and the installer may crash and still have some bugs. An overview of the supported harware can be found here. Neuhaus J, Kast J, Wegner I, Baumhauer M, Seitel A, Gergel I, Nolden M, Maleike D, Wolf, I, Meinzer HP, Maier-Hein L. Building image guided therapy applications with the Medical Imaging Interaction Toolkit. Int J CARS (2009) 4 (Suppl 1):S270-271. This page was last modified on 21 April 2015, at 15:36. This page has been accessed 46,185 times.